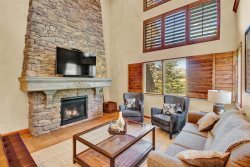 This town home is decked out top to bottom with the finest in mountain contemporary furnishings. There's plenty of room for multiple families with 5 bedrooms, bonus rooms, theater room, etc spread out over 3 floors. There's even a kids "dorm" area with 3 sets of bunk beds! (sleep 6 kiddos). This particular unit is special because it is located at the end of a quiet cul-de-sac and next door to a private clubhouse with a killer workout center. There is nothing finer in the entire area. Powder Mountain and Snowbasin are minutes away. There's even a shuttle stop at the complex to Powder Mountain. Townhome is situated on the Wolf Creek Golf Resort. Boating - bring your boat and Jet Skis, Short drive to Pineview reservoir Outdoor Deck / Patio Mountain View Resort View - streams and wildlife area to the north - always deer! 5-Star Mountain Luxury 4 Br Cascades Home Theater - Next To Clubhouse AMAZING!! We took our church youth group (just girls) here for our annual "Girls Camp." We loved it!! The condo was well equipped, slept 13 of us very comfortably & the kitchen was very spacious. The garage was an added bonus, the swimming pool, hot tub also proved to be nice amenities. Would definitely stay there again!! !